Draft resolution to be submitted by Palestinian Authority calls on the Security Council to "ends the Israeli occupation without delay". The Palestinian Authority (PA) will ask the United Nations (UN) Security Council to set a deadline of November 2016 for Israel to “end the occupation”, according to the draft resolution obtained Wednesday by The Associated Press (AP). The circulation of the draft resolution to council members follows PA Chairman Mahmoud Abbas's announcement to the UN General Assembly last Friday that he would ask the council to set a deadline for a pullout and dictate the ground rules for any talks with Israel. The draft resolution, according to AP, would affirm the Security Council's determination to contribute to attaining a peaceful solution that ends the “Israeli occupation without delay" and fulfills the vision of two states — "an independent, sovereign, democratic, contiguous and viable state of Palestine" living side by side with Israel in peace and security in borders based on those before the 1967 Six Day War. The draft calls for intensified efforts, including through negotiations, to reach a peaceful settlement of the Israeli-Palestinian conflict and "a just resolution" of the status of Jerusalem as the capital of two states and of the Palestinian refugee problem, according to AP. Its key provision calls for "the full withdrawal of Israel, the occupying power, from all of the Palestinian territory occupied since 1967, including East Jerusalem, as rapidly as possible and to be fully completed within a specified timeframe, not to exceed November 2016, and the achievement of the independence and sovereignty of the state of Palestine and the right to self-determination of the Palestinian people." Abbas’s move is a unilateral one and is in direct violation of the Oslo Accords. 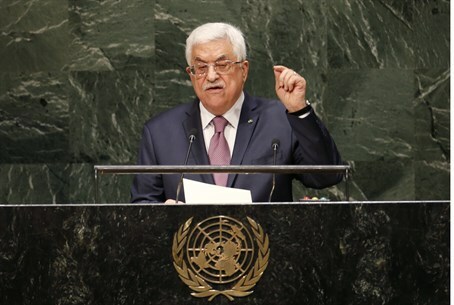 Abbas has also threatened that if the United States vetoes his “deadline to end the occupation” resolution at the Security Council, he will “re-examine” the PA's security cooperation with Israel. Speaking to reporters in Ramallah on Wednesday, Abbas said that if a veto is cast, he will press charges against senior Israeli officials at the International Criminal Court in the Hague, even at the price of being charged there himself along with them. U.S. Ambassador to the UN Samantha Power, asked Tuesday about Abbas's call for a deadline, said, according to AP, "We strongly believe that the only way of a negotiated solution is through negotiations between the two parties."